Divorce Magazine Blog – Ranked #1 Divorce Blog Since 2015! 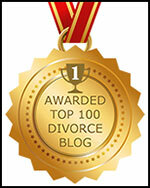 Welcome to the Divorce Magazine Blog: ranked as the #1 Divorce Blog on the Internet for the past three consecutive years! In these pages, you’ll find posts by experts as well as posts by individuals who are facing the challenges of separation, the divorce process, and life after divorce. We hope you find these text and video separation and divorce blog posts interesting and informative – and a source of support and advice as you make your way through divorce into a new life. For information about becoming a blogger for this website, click here.